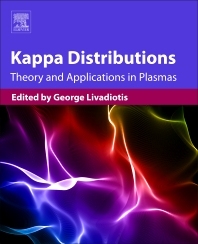 Kappa Distributions: Theory and Applications in Plasmas presents the theoretical developments of kappa distributions, their applications in plasmas, and how they affect the underpinnings of our understanding of space and plasma physics, astrophysics, and statistical mechanics/thermodynamics. Separated into three major parts, the book covers theoretical methods, analytical methods in plasmas, and applications in space plasmas. The first part of the book focuses on basic aspects of the statistical theory of kappa distributions, beginning with their connection to the solid backgrounds of non-extensive statistical mechanics. The book then moves on to plasma physics, and is devoted to analytical methods related to kappa distributions on various basic plasma topics, spanning linear/nonlinear plasma waves, solitons, shockwaves, and dusty plasmas. The final part of the book deals with applications in space plasmas, focusing on applications of theoretical and analytical developments in space plasmas from the heliosphere and beyond, in other astrophysical plasmas. Kappa Distributions is ideal for space, plasma, and statistical physicists; geophysicists, especially of the upper atmosphere; Earth and planetary scientists; and astrophysicists. 1.4. Nonextensive Statistical Mechanics, in Brief! 12.6. Are Kappa Distributions Useful for Magnetospheric Research? 17.3. Are Energy Kappa Distributions Present in Astrophysical Nebulae? Dr. George Livadiotis is a Senior Research Scientist in Southwest Research Institute. He is a leading expert on the field of kappa distributions and its statistical background, the framework of non-extensive statistical mechanics. Among other theoretical achievements, he developed (i) the connection of kappa distributions with non-extensive statistical mechanics, (ii) the formula of entropy that is related to the kappa distributions, (iii) the generalization of kappa distribution to describe the whole Hamiltonian of particles, the kinetic and potential energy, (iv) the different types of consistent formulae of kappa distributions, (v) the shock Rankine–Hugoniot conditions for kappa distributions. Among other applications, he used kappa distributions to describe the proton populations in many space plasmas in the heliosphere and the heliosheath.